One of the most common confusions is the difference between masticating juicers and centrifugal juicers. If you’re a health-conscious person, you know that fresh fruit juices pack a powerhouse of nutrition. But once you start looking for juicers, things can get a little confusing. Here’s the difference between the two, so you can choose the one that is best for you. Masticating juicers are very similar to our own teeth. They use an auger to grind fruits and vegetables to a pulp – just like what happens when we chew. The pulp is pushed up against a strainer, so the juice drains out and leaves the pulp behind to be ejected out. These are also known as single gear juicers. These types of juicers are more effective and efficient, because they create more juice from the same amount of fruit and vegetables. They run at a lower RPM, which results in less foaming of the juice…and that’s a good thing, because the more foam, the more oxidation that can result and destroy beneficial enzymes. The majority of models can handle most fruits and vegetables, and many of them can also make other foods like pates, nut butters and baby food. They do tend to be more expensive, costing anywhere between $200-$300. Examples of masticating juicers include the Champion juicer, the Samson 9001 and the Omega juicer. Centrifugal juicers use a spinning wire mesh basket to grate raw foods very finely, and extract the juice by centrifugal force. The pulp may be ejected from the machine, or remain in the basket to be emptied later. These models are much less expensive than masticating models, starting at around $40. However, you need to watch the spin speed. The higher the RPM of the basket, the likelier the juice will foam, oxidize and lose enzymes. You also have to watch the size of the feed tube, as larger feed tubes tend to lose smaller pieces of food, where they end up not being grated. So there is more waste, and less juice, than with masticating models in this case. 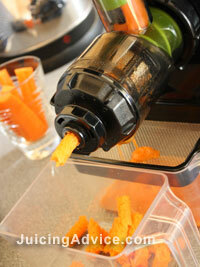 Masticating juicers are more expensive, but if you juice frequently they are worth spending a little more on. They take a wide range of raw material, and give you more juice in the long run. The juice they give you also contains more vitamins and minerals as most models use a lower spin speed. Need more information? Find out more about the different types of juicers.